PerryGolf is proud to partner with Azamara Club Cruises for an exceptional 13 night, 5 round golf voyage around Europe onboard the outstanding 690 guest Azamara Quest. 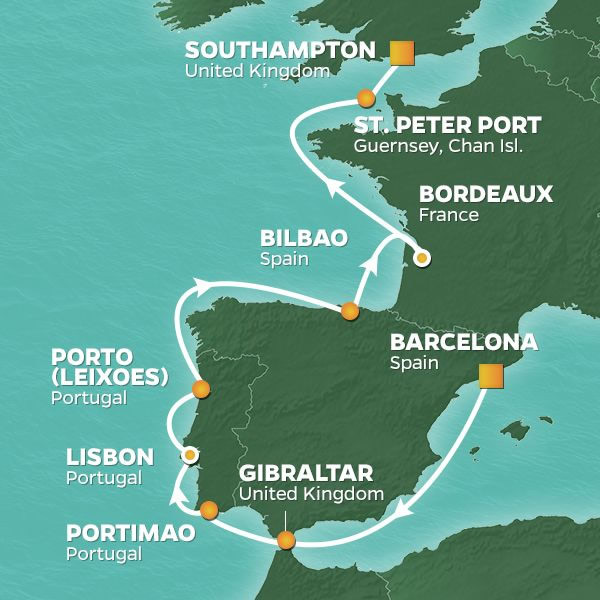 We begin in Barcelona with eight captivating ports of call ahead including Gibraltar, Portimao, Lisbon, Porto, Bilbao, Bordeaux, Guernsey and finally, Southampton. Our golf includes five outstanding rounds at the exceptional courses La Reserva, Faldo Amendoeira, Oitavos Dunes, Estela and Golf du Medoc. ... Read More. Enjoy the many charms of Lisbon - an ancient city that’s hardly living in the past. There’s bustling activity around the magnificent harbor as hundreds of thousands of visitors travel here annually from around the world. In Bordeaux, enjoy the estates and wineries built on the strong back of the mighty grape, learning about the region’s wonderful offerings by tasting plenty. The golf is terrific, with the possible highlight in Oitavos Dunes, a coastal beauty designed by American architect Arthur Hills and worthy of its lofty ranking. The guest list will number between 40 and 60, most of whom are golf couples although it’s common to have non-golfers who will enjoy themselves as a luxury cruise guest starting with Azamara Quest’s fabulous facilities along with a wide selection of Azamara Shore Excursions®. The “2020 Spain, Portugal & France Golf Cruise” is a full-featured vacation and a unique opportunity to enjoy yourself in the company of like-minded new friends! Embark Azamara Quest beginning at 1:00PM. All aboard by 4:30PM. GOLF: La Reserva was designed by acclaimed golf course architect Cabell B. Robinson and is carved into the hillside with stunning vistas down to the Mediterranean Sea and up to the Andalusian hills. Opened in 2003, its wide, sweeping fairways lead on to large greens with gentle but challenging undulations. It has fast become a must-play for any golfer visiting southern Spain and is a fitting next chapter in Sotogrande’s proud golfing legacy. SIGHTSEEING: The Rock of Gibraltar is a sight to behold rising nearly 1,400 feet out of nowhere located in a strategic position at the southern end of the Iberian Peninsula. It overlooks the Straits of Gibraltar and is linked to Spain by a narrow isthmus. Most of the upper Rock, starting just above the town, is a nature reserve with spectacular views accessible by cable car. Gibraltar is imposing but small. It measures less than two and a half square miles and is inhabited by around 30,000 people made up of Gibraltarians, British, Moroccans, Indians and Spanish. There is a colony of the famous, camera-hogging Barbary apes who run free in a semi-wild state. Gibraltar is a British self-governing colony and a member of the European Union by virtue of Britain's membership. GOLF: The Faldo Course at Amendoeira, designed by Sir Nick Faldo, opened for play in 2008. In a modern twist of a traditional recipe, cacti and wild herbs replace the role of Sunningdale’s heather, and spartan holm oaks and ancient olive trees take the place of a lush English woodland, and desert scrub bunkers of crushed limestone replace Berkshire’s sandy tracts in a golf course that revels in the classic principles of strategic play. It also enjoys great views, in particular on the back nine. SIGHTSEEING: Portimão is located in the District of Faro in the Algarve Region of Portugal, and is the host venue for many prestigious sailing events. The Lisbon to Dakar Rally passes through, and there is also surfing and kite surfing. This is a great place for seafood restaurants with grilled sardines being the specialty. Lisbon is one of the oldest cities in the world. Its magnificent harbour made it a logical trading port as far back as the Phoenicians, as well as a departure point for 15th century voyages sponsored by Prince Henry the Navigator, patron of Portuguese explorers. The city is rich in architecture, from Romanesque and Gothic to postmodern, and criss-crossed by monument-studded grand boulevards. Today it is seeking a place on the world stage by hosting, in addition to its own active cultural calendar, film festivals, art, fashion and design shows, book fairs, marathons, and rock concerts. Enjoy Lisbon on your own or via Azamara Shore Excursions®. GOLF: Oitavos Dunes is located on the most westerly tip of Europe and mixes wondrous views of the Atlantic Ocean against the stunning backdrop of the Sintra Mountains. Oitavos was designed by the renowned Arthur Hills and is one of two European Courses that bear his name. The course was inaugurated in 2001 and has been ranked in the top 100 in the world. Oitavos Dunes is a par 71 course that measures 6,900 yards from the competition tees. The layout is a lovely mixture of woodland and links-type holes that capitalize on the existing landscape. GOLF: Private and exclusive, Estela is located a half-hour drive from Porto, shaggy dunes border narrow fairways on a 6,800-yard layout that includes two miles of Atlantic Ocean coastline. The spectacular scenery is complemented by the excellent condition of the penncross bentgrass greens and tifton bermuda fairways. Duarte Sottomayor, who studied golf course architecture under the acclaimed Robert Trent Jones Sr., designed Estela with the touch of a minimalist, allowing stiff breezes and the natural terrain to create a formidable, enjoyable challenge. SIGHTSEEING: At the mouth of the Rio Douro lies the city of Porto, famous for its port wine trade. With origins dating back to the 5th century, there is plenty to see in this town that was named European Capital of Culture in 2001. Stroll the Ribeira neighborhood along the river, explore the Cathedral area, or tour the port lodges of Vila Nova de Gaia across the river. Savoring a taste of tawny port, trip and seafood while here is highly recommended. Enjoy Porto on your own or via Azamara Shore Excursions®. If Bilbao wasn’t always a household name, it was transformed into one with the opening of Frank Gehry’s groundbreaking Guggenheim Museum in 1997. Located in the heart of the Basque Country, Bilbao became an instant media darling and tourist mecca. And that was just the beginning of an exciting phase of development in infrastructure and cultural activity which, combine with the Basque love of food, wine and laughter, solidified the city’s place in the annals of tourism. Enjoy Bilbao on your own or via Azamara Shore Excursions®. Bordeaux’s fortunes have long been tied to viticulture, beginning with an expansion of the wine trade with England in the 14th century. As a result it is a handsome and cohesive city of uniform classical and neoclassical style, with monumental buildings and many fine estates financed by the almighty grape. The nearby countryside is alive with wine chateaux sporting impressive appellations such as Pauillac, Sauternes, Margaux, and Saint-Emilion. A visit is an excellent opportunity to learn more about wine production and appreciation, which of course requires a considerable amount of tasting to accomplish. Enjoy Bordeaux on your own or via Azamara Shore Excursions®. GOLF: Golf du Medoc crafted from the genius of American architect Bill Coore, this Scottish links style course opened in 1989 and has earned its reputation for immaculate putting surfaces. Consistently ranked in the top 100 in Continental Europe, the Chateaux course evokes images of classics such as Sunningdale and Swinley in the British Isles, combining heather, gorse, broom and, of course, the menacing wind. No. 11 is a intriguing risk / reward par-4. A creek bisects the fairway and demands a decision, offering bold and conservative routes to the green. We depart Bordeaux early for a relaxing day and a half at sea. Guernsey, or the Bailiwick of Guernsey by its official title, is a self-governing possession of the British Crown found off the coast of Normandy, France in the English Channel. It is a wonderful juxtaposition of England and France with an English lean by virtue of the Norman invasion of England in 1066. St. Peter Port overlooks the harbor, with rows of brightly painted houses, and terraced gardens. The island is ideal for rambles along cliffside paths and through the bucolic interior. While fishing, flower growing, and dairy farming are still important, Guernsey's favorable tax climate has brought an influx of offshore banks and insurance companies with their attendant bistros and boutiques. It was here in exile from 1855-1870 where Victor Hugo wrote some of his best-known works including Les Misérables. Enjoy Guernsey on your own or via Azamara Shore Excursions®. was designed by acclaimed golf course architect Cabell B. Robinson and is carved into the hillside with stunning vistas down to the Mediterranean Sea and up to the Andalusian hills. Opened in 2003, its wide, sweeping fairways lead on to large greens with gentle but challenging undulations. It has fast become a must-play for any golfer visiting southern Spain and is a fitting next chapter in Sotogrande’s proud golfing legacy. The Faldo Course at Amendoeira, designed by Sir Nick Faldo, opened for play in 2008. In a modern twist of a traditional recipe, cacti and wild herbs replace the role of Sunningdale’s heather, and spartan holm oaks and ancient olive trees take the place of a lush English woodland, and desert scrub bunkers of crushed limestone replace Berkshire’s sandy tracts in a golf course that revels in the classic principles of strategic play. It also enjoys great views, in particular on the back nine. Oitavos Dunes is located on the most westerly tip of Europe and mixes wondrous views of the Atlantic Ocean with the stunning backdrop of the Sintra Mountains. Oitavos was designed by the renowned Arthur Hills and is one of only two European Courses that bear his name. The course is a recent addition to the area in golfing terms and was inaugurated in 2001 while now ranking in the world’s top 100 courses. Oitavos Dunes is a par 71 course that measure 6,300m from the competition tees. The course is a lovely mixture of woodland and links-type holes that make the most of the existing landscape. Private and exclusive, Estela is located a half-hour drive from Porto, shaggy dunes border narrow fairways on a 6,800-yard layout that includes two miles of Atlantic Ocean coastline. The spectacular scenery is complemented by the excellent condition of the penncross bentgrass greens and tifton bermuda fairways. Duarte Sottomayor, who studied golf course architecture under the acclaimed Robert Trent Jones Sr., designed Estela with the touch of a minimalist, allowing stiff breezes and the natural terrain to create a formidable, enjoyable challenge. Crafted from the genius of American architect Bill Coore, Les Châteaux at Golf du Médoc is a Scottish links style course opened in 1989 and has earned its reputation for immaculate putting surfaces. Consistently ranked in the top 100 in Continental Europe, the Chateaux course evokes images of classics such as Sunningdale and Swinley in the British Isles, combining heather, gorse, broom and, of course, the menacing wind. No. 11 is a intriguing risk / reward par-4. A creek bisects the fairway and demands a decision, offering bold and conservative routes to the green. The Faldo Amendoeira Course at Amendoeira, designed by Sir Nick Faldo, opened for play in 2008. In a modern twist of a traditional recipe, cacti and wild herbs replace the role of Sunningdale’s heather, and spartan holm oaks and ancient olive trees take the place of a lush English woodland, and desert scrub bunkers of crushed limestone replace Berkshire’s sandy tracts in a golf course that revels in the classic principles of strategic play. It also enjoys great views, in particular on the back nine. Crafted from the genius of American architect Bill Coore, this Scottish links style course opened in 1989 and has earned its reputation for immaculate putting surfaces. Consistently ranked in the top 100 in Continental Europe, the Chateaux course evokes images of classics such as Sunningdale and Swinley in the British Isles, combining heather, gorse, broom and, of course, the menacing wind. No. 11 is a intriguing risk / reward par-4. A creek bisects the fairway and demands a decision, offering bold and conservative routes to the green.